Intervention autonomous underwater vehicles (I-AUVs) have the potential to open new avenues for the maintenance and monitoring of offshore subsea facilities in a cost-effective way. However, this requires challenging intervention operations to be carried out persistently, thus minimizing human supervision and ensuring a reliable vehicle behaviour under unexpected perturbances and failures. 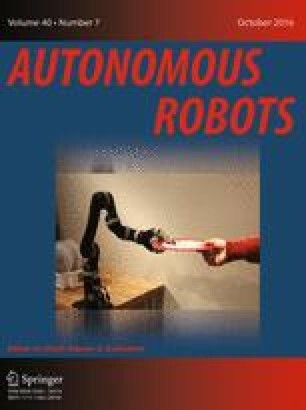 This paper describes a system to perform autonomous intervention—in particular valve-turning—using the concept of persistent autonomy. To achieve this goal, we build a framework that integrates different disciplines, involving mechatronics, localization, control, machine learning and planning techniques, bearing in mind robustness in the implementation of all of them. We present experiments in a water tank, conducted with Girona 500 I-AUV in the context of a multiple intervention mission. Results show how the vehicle sets several valve panel configurations throughout the experiment while handling different errors, either spontaneous or induced. Finally, we report the insights gained from our experience and we discuss the main aspects that must be matured and refined in order to promote the future development of intervention autonomous vehicles that can operate, persistently, in subsea facilities. This work has been supported by the FP7-ICT-2011-7 project PANDORA-Persistent Autonomy through Learning, Adaptation, Observation and Re-planning (Ref. 288273) funded by the European Commission. Calonder, M., Lepetit, V., Strecha, C., & Fua, P. (2010). BRIEF: Binary robust independent elementary features. In Proceedings of the 11th European conference on computer vision: Part IV, ECCV’10 (pp. 778–792). Berlin, Heidelberg: Springer-Verlag. http://dl.acm.org/citation.cfm?.id=1888089.1888148. Hovland, G., Sikka, P., & McCarragher, B. (1996). Skill acquisition from human demonstration using a hidden Markov model. In Proceedings of the 1996 IEEE international conference on robotics and automation (Vol. 3, pp. 2706–2711). doi: 10.1109/ROBOT.1996.506571. Jones, C. (2012). Slocum glider persistent oceanography. In 2012 IEEE/OES autonomous underwater vehicles (AUV) (pp. 1–6). doi: 10.1109/AUV.2012.6380738. WillowGarage (2007). Robot operating system. http://www.ros.org Retrieved December, 2014.